Once a vital, hilarious stand-up comic and performer, now a disappointing family comedy bore, Steve Martin still has a certain charm to him that not even a botched Peter Sellers remake could destroy. Fortunately, he's channelling that charm into an area of his expertise that's hard to argue with - his skilful and highly entertaining banjo playing. Out today is Martin's new album, The Crow, a collection of 15 original songs written and performed by the Jerk himself. 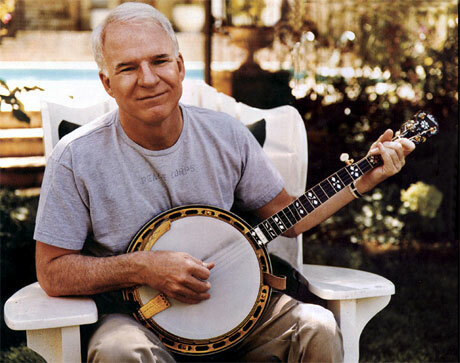 The album, which features guest spots from country legends like Dolly Parton, Earl Scruggs and Vince Gill, among many others, showcases Martin's penchant for bluegrass fingerpick-ery and goofy sing-alongs. "I know what my specialty is - playing songs I write, and if I'm asked to step outside that specialty, I can get a little nervous," he revealed to Billboard. "It's a dichotomy; on one hand I can play my own songs with anybody, but if I got into a really serious bluegrass crowd, I'd play a couple standards and retire." Martin is already nominated for a Grammy for the audiobook of his best-selling memoir Born Standing Up. Now if we could only prevent The Pink Panther 2 from coming out he'll be on a role. 1. "Daddy Played the Banjo"
2. "Pitkin County Turnaround	"
8. "Wally on the Run"
10. "Saga of the Old West"